It’s that time of year. If you haven’t already taken the all smiles family photo then you are likely scrambling to capture one so you can finalize your holiday card. These days, once you get the photo you can automate the entire process if you choose. Send a traditional card and a printing house will address your envelopes, stuff your card, put the stamp on and send it out the door. Select the digital route and your holiday message can instantly be delivered with a click of a button. And, while this is rather efficient, I think we lose a little something in the process. Before the ease of social media and automation, the traditional holiday card was how many of us shared pictures, news and when we wrote notes to family or friends. Today, not so much. In fact, I know many who have eliminated the traditional holiday card all together because of the ease of sending a holiday message in other ways. But what do we lose when we take ourselves out of the process or send an electronic message? An opportunity to connect in a more meaningful way. So how could you make your card more meaningful? A handwritten personal note. According to Gallup News, only 41% of American adults look forward to checking their electronic mailbox. Yet, more than 90 percent say they enjoy receiving personal letters and cards. So yes, it will take more effort on your part to handwrite a note on your holiday card but you will be putting to practice the circle of comfort and can bring joy to someone’s day. Here are a few benefits you or your recipient might receive if you take the step of adding a handwritten note. 1) As you prepare to write on a card you get to think about the person you are writing to. It’s a great opportunity to reflect on your relationship with them. An opportunity to recall good memories. 2) You then get to choose a personal message to write to this person. Maybe it’s been a great year with lots to rejoice or a difficult year – this is your opportunity to acknowledge and give them a short note of encouragement, support or even thanks. 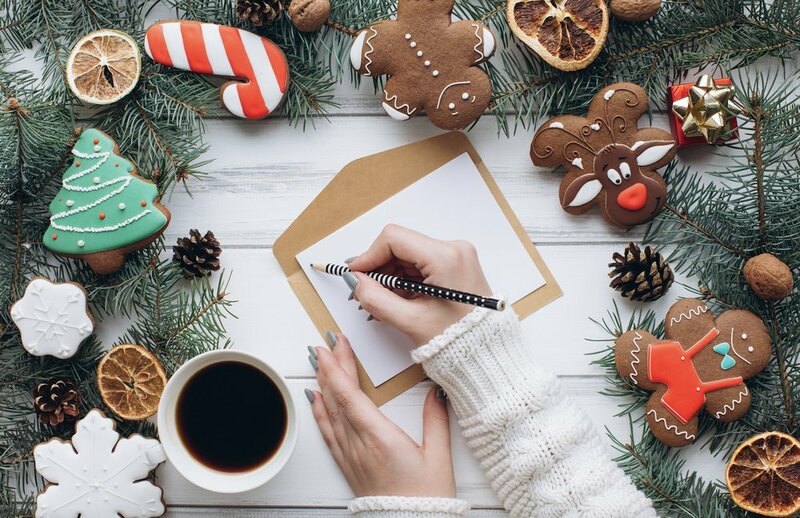 3) Sending your holiday card with a short note can bring deeper connection by letting your recipient know that they are not just part of an automated process. It shows them your relationship matters. 4) Finally, by focusing on a short note for someone else you get to mentally connect with them. Research suggests that connecting with friends may produce less of the stress hormone cortisol which during the holiday season is something we can all benefit from. So this year give it a try. You may just like how it feels to connect and reflect in this busy and stressful time of the year. And, certainly, your friends and family will enjoy seeing your note.